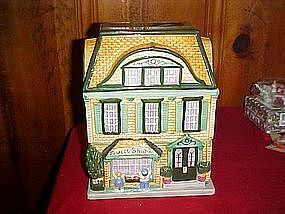 Hand decorated ceramic cookie jar by Sherwood. The cottage style house is actually a sweets shop. Could use either side, the back side looks like a regular cottage. Nice condition. One very tiny glaze flake that could be touched up easily. Measures 9 1/2" tall.